This chapter discusses the fulfillment of the requirements for a green process, together with the importance of the nicotinate vitamin B3. Lonza's contribution to green chemistry is then illustrated by its processes for producing nicotinates. The current niacinamide process running is China employs no fewer than six basic principles of green-sustainable chemistry. 1. Choice of feedstock (costs are relevant of course, but also total resources, energy, waste, etc. in the manufacture of the given feedstock are important factors). 2. Choice of reaction path (minimize energy requirements by use of selective catalysts). 3. Choice of catalyst (efficiency, separation and recycling of catalyst). 4. Down-stream processing/unit operations (minimizing the number of stages necessary to obtain the product in the state desired by the customer). 5. Minimizing not only the amount of pollutants but also the volume of waste streams (effluent/off-gases and solid waste). 6. Recycling of auxiliary, side-, and intermediate products into the process. 7. Avoidance of hazardous or toxic materials wherever possible. Since the human body produces neither nicotinic acid nor the amide, it is dependent on intake via foodstuffs. Although niacin is found in a bound form naturally in wheat, yeast and pork and beef liver, most niacin today is produced synthetically by chemical oxidation of alkyl pyridines. To demonstrate the economic significance of this, in 1995 worldwide a total of 22 000 metric tonnes of niacin and niacinamide were produced. Today between 35 000 and 40 000 tonnes are produced and the demand for nicotinates is rising. Thus, both economic and ecological factors play a significant role. 3-Alkylated pyridines such as 3-picoline, 3(5)-ethylpyridine and 2-methyl-5-ethyl-pyridine (MEP) are the natural choice as starting materials for the nicotinates. The choice of alkyl pyridine is governed by their availability and the process being used. Pyridine bases such as 3-picoline and MEP are predominantly manufactured by the Chichibabin reaction, where a mixture of aldehydes or ketones is reacted with ammonia. Thus, formaldehyde, acetaldehyde and ammonia react in the gas phase to produce a mixture of pyridine and 3-picoline. By choosing the appropriate aldehyde or ketone, catalyst and phase (liquid or gas phase), the composition of the mixture can be varied at will, depending on the desired end-product. In the gas phase, silica alumina catalysts are often used, while in the liquid phase acid catalysts based on phosphoric or acetic acid are employed. In the 1990s, Reilly patented MFI- and BEA-based zeolite catalyst compositions for ammonia-aldehyde conversions to pyridine, picolines and alkyl pyridines. Chemically, 3-picoline is the ideal starting-material for nicotinic acid or amide: the methyl group can be selectively and readily oxidized to the carboxyl derivative with few by-products or pollutants. High selectivity coupled with the low molecular weight ratio (1:1.3) compared to the end-products make picoline an attractive industrial starting-material for the production of nicotinic derivatives. 3-Picoline is obtained, typically in a 1:2 ratio along with the main product pyridine, by the gas-phase reaction of acetaldehyde, formaldehyde and ammonia. The lack of selectivity of this reaction to either pyridine or picoline has hitherto meant that the economy of the major product (pyridine) has determined the price and availability of picoline. Consequently, producers of pyridine have been able to control the quantity and prices of picoline on the market. This has led to the search for alternative feedstock and manufacturing processes for picoline. 2-Methyl-5-ethyl-pyridine (MEP) is used as a starting material for the high temperature and pressure liquid-phase oxidation with nitric acid. The reasons for this apparently unlikely choice of starting material are many. MEP can be made in the liquid phase from acetaldehyde and ammonia selectively (around 70%) compared to picoline (20-40%) from the traditional picoline/pyridine process. It is thus considerably cheaper to produce than picoline. The reaction of MEP with nitric acid is also surprisingly selective (>80%). The resulting nitric oxide gases are recycled and reacted with air and water to reconstitute nitric acid. This process has been utilized for nearly 40 years by Lonza for producing niacin. As mentioned above, the bulk of picoline is produced today by condensation of acetaldehyde, formaldehyde and ammonia in the gas phase, which simultaneously produces large quantities of pyridine. A selective and suitable alternative method starting from these or similar simple molecules has yet to be developed. Given the thermodynamic properties of the molecules and reactions involved it does not seem likely to expect a selective process for 3-picoline in the near future following this strategy, although shape-selective catalysts may hold a key. 15.3.2.1 Liquid-Phase Oxidation of Nicotine with Permanganate, Chromic Acid, etc. 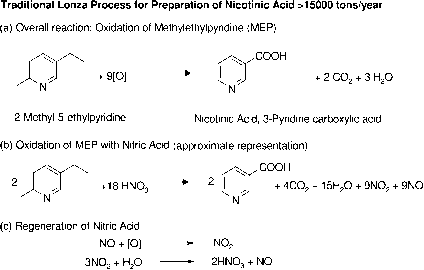 The classic method of preparing nicotinic acid was by oxidizing nicotine with potassium dichromate (Scheme 15.1). This was discovered over 100 years ago. 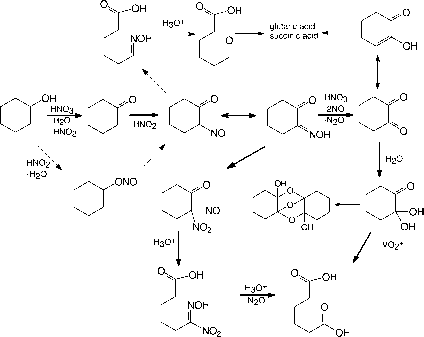 Scheme 15.1 Original chromic acid oxidation of nicotine to nicotinic acid. Table 15.1 By-products arising from the production of 1 tonne of nicotinic acid from 1.32 tonne of nicotine and 9.02 tonnes of chromic acid. Although no longer relevant today, this reaction serves as an excellent example when considering green technology. 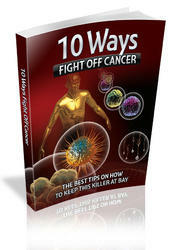 Chromic acid (CrO3) is carcinogenic and environmentally threatening. Chromic (III) oxide, on the other hand, is extensively used in the tanning industry, and has a higher present value on the market than its precursor. Assuming an ideal chemical reaction (100% yield! ), the above reaction gives the figures shown in Table 15.1. Thus almost 9 tonne of by-product are produced for 1 tonne of the desired product. The oxidation of picoline with permanganate or chromic acid suffers from the same drawback, albeit in a lesser form, as nicotine (Scheme 15.2). 1. The combining oftwo economies in one process requires that both end-products (here chromic oxide and nicotinic acid) can be sold. Thus the success of the process is dependent on the demand for both products being sustained. A collapse of one leg will invariably lead to the process as a whole being unsustainable. The dependence of picoline on pyridine illustrates this point. 3. Environmental problems in the leather industry due to chromium pollution can be solved, but are expensive and the alternatives are not without their own problems. 3-Picoline (as KMnOd) (as H2S04) Nicotinic Acid Scheme 15.2 Permanganate oxidation of 3-picoline. Niacin is used as a feed and food additive. The presence of even small quantities of chromium, however beneficial this may be in practice (chromium is an essential trace metal in the human metabolism), is not likely to be accepted by either today's stringent legislation or by buyers who are geared to high-quality supplies. Removal of last traces of impurity is possible by recrystallization, but this increases the number of unit operations, is therefore expensive and energy consuming, and the problem remains as to what to do with the chromium-containing mother liquors. 15.3.2.3 Liquid-Phase Oxidation ofMEPwith Nitric Acid (Scheme 15.3) This process has been running for the past 40 years in Lonza's plant in Visp Switzerland and is surprisingly selective. Continuous development and improvement of this process over the years have led to a high-quality product, and to Lonza's ability to maintain their position as the world leader in niacin manufacture. Scheme 15.3 Traditional Lonza process for the preparation of nicotinic acid. 1. Safety: using nitric acid at high temperatures and pressures requires a well-conceived and continually executed safety concept, using advanced reaction technology. 2. Ecology (carbon dioxide and nitric oxides): although nitric oxide fumes can be largely regenerated to nitric acid, some nitric oxide (NO) is invariably present in the off-gases, which then have to be catalytically treated to remove the last traces of NOx. Carbon dioxide, however, cannot readily be recycled, and this is vented to the atmosphere. In today's process (including deep oxidation ofthe starting-material), as can be readily calculated from the reaction equation, over 1 tonne of CO2 is produced per tonne of niacin. 3. Downstream processing: to produce a product quality acceptable to today's standards, extensive processing in the form of recrystallization and decolorizing is necessary. As mentioned above, recrystallization is an energy and labor intensive process. 4. Starting-material: although MEP is produced from cheap starting-materials (ammonia and paraldehyde), the process itself produces considerable quantities of by-products and/or waste material, which have to be separated and suitably treated to avoid environmental pollution. Additionally, the carbon efficiency ofthe MEP conversion into niacin is at best only 0.75 (two carbon atoms are burnt off during oxidation), so that, from the green standpoint, MEP is not the ideal starting material. 15.3.2.4 Direct Oxidation of 3-Picoline to Niacin (Scheme 15.4) Direct oxidation of 3-picoline with oxygen or air offers the most logical route to nicotinic acid although the reaction technology is not as simple as the ammoxidation. For this reason there is as yet no known industrial plant operating with direct oxidation. However, under controlled conditions and a careful design of catalyst, high selectivity and throughput can be achieved on a semi-commercial scale. 1. Use of air as oxidant instead of stoichiometric quantities of chemical oxidizing agents. 2. Use of catalysts to promote reaction. 3. Reaction carried out at atmospheric pressure. 4. Gas-phase reaction means that catalyst does not have to be recovered from solution. 5. Energy from exothermic reaction can be recuperated. 6. Few unit operations necessary to obtain the pure product. 7. The only solvent used is water. 8. Waste is minimized by a highly selective reaction. 9. Conversion is high, leading to an efficient use of equipment, energy and material. 10. Throughput is acceptable for a commercial process. Scheme 15.4 Reactions in the gas-phase oxidation of picoline to nicotinic acid. The above examples using stoichiometric or excess quantities of chemical oxidants are contrary to the principles of today's green chemistry. The use of carefully designed catalysts enables the reaction to be carried out in the gas phase in a fixed or fluidized bed with air or oxygen as the oxidizing reagent. Gas-phase technology eliminates any catalyst separation or recycling procedures that are necessary in liquid-phase operations. Fixed- and fluidized-bed oxidation catalysts are usually relatively simple in chemical composition, but the development of a robust and selective catalyst is a complex task, often requiring years of patient research and development. Beside the requirement of high selectivity at high throughput, fixed-bed catalysts should possess a long lifetime, since changing the catalyst in a multi-tubular reactor with anything from 5000 to 25 000 tubes is not a trivial undertaking. Goal: to minimize the number of stages necessary to obtain the product in the state desired by the customer. Separation techniques such as crystallization, distillation and drying generally involve some losses of product and consume considerable amounts of energy, but are usually necessary at some stage, as 100% selectivity is unusual outside biochemical and biological processes. However, the more selective the reaction, the purer the end-product will be and thus require fewer steps or less energy to meet the quality required. The direct oxidation method produces few by-products and the reaction solution already has a high degree of purity. Since no other materials are involved in the direct oxidation than picoline, water and air or oxygen, any pollutants arising must be by-products of the reaction. It therefore follows that the higher the selectivity the fewer the potential pollutants and the smaller the waste streams. In the direct-oxidation process, the major side-reaction is deep oxidation, so that the major pollutant is carbon dioxide. Green principles dictate here that efforts should continue to be made to further reduce the CO2 emission by increasing selectivity. In selective gas-phase oxidation processes the conversion often does not reach 100%, in order to reduce total oxidation. This means that some starting material and/or intermediate products are present in the reaction mixture. Following separation, these may be recycled into the reaction to avoid yield losses. Although the above may seem obvious, an economical and efficient recycling procedure is not always simple, depending on the volatility of the components involved and the concentration of any unwanted by-products. In practice, a purge is included in the recycle to maintain an equilibrium concentration of by-products. Lonza's production of niacinamide in China incorporates aspects of practically all the elements of green chemistry outlined above (Scheme 15.5). The advantages of 3-picoline as a starting material and the disadvantages of the main manufacturing method have been described above. To avoid the latter, Lonza has developed a viable two-stage alternative starting from 2-methylpentanediamine (MPDA). MPDA is readily obtained by hydrogenating 2-methylglutaronitrile, the major by-product in the adiponitrile process and, as such, a readily available startingmaterial (~105 mtpa). In the first stage MPDA is cyclized to methylpiperidine, which is then dehydrogenated to 3-picoline (Scheme 15.6). Scheme 15.5 Lonza's nicotinamide process (Guangzhou, China). Scheme 15.6 Alternative process for picoline manufacture. 1. The 3-picoline produced has a very high isomeric purity. 2. Picoline is produced in a two-stage catalytic process that is practically energetically neutral: an endothermic (ring closure) and an exothermic (dehydrogenation) reaction. 3. Ammonia liberated during the ring closure can be utilized in a subsequent process. 4. Utilization of a waste-product (2-methylglutaronitrile can be used as a co-monomer in the production of other polyamides, but the end-product niacin has an intrinsically much higher value). The advantages of the alternative picoline process are described above. It also illustrates that, in order to reduce the amount of waste produced in reaction, a starting material of the highest quality is desirable, since any by-products in the latter would have to be removed later in the process. The ammonia liberated in the cyclization step of MPDA is utilized in the ammoxidation step. This is an example of recycling a by-product that would otherwise require disposal. Scheme 15.7 Ammoxidation of 3-picoline and hydrolysis to niacinamide and niacin. elevated reaction temperatures deep oxidation is slight and the heat generated by the reaction is recuperated and utilized elsewhere in the process. Cyanopyridine generated by the ammoxidation is hydrolyzed using an enzymatic catalyst with practically quantitative yields. This efficient procedure avoids the consecutive hydrolysis reaction to nicotinic acid (here a by-product!). Starting from MPDA an overall yield for the process of around 90% is obtained, which means that the carbon efficiency (ratio of carbon in product to reactants) and overall atom efficiency (yield ratio of molecular weight of product to reactant) are 90% and 99%, respectively. The waste and any toxic by-products generated from the process are catalytically treated to give nitrogen, water and low quantities of carbon dioxide (about 200 kg per ton nicotinamide). The energy-neutral picoline route and the resourceful recuperation and reutili-zation of energy in the exothermic ammoxidation contribute to low-energy requirements in the process. 1. Waste is prevented by a highly selective process over four chemical or biochemical steps. 2. Atom and carbon efficiencies are high (90-100%). 3. The reagents used (3-picoline, water, air) are not particularly toxic (picoline LD50 = 420 mgkg-1). The ammonia necessary for the ammoxidation is predominantly obtained as a by-product in the production of 3-picoline. Any toxic by-products are catalytically converted into benign material. 4. Benign solvents are used (water and toluene for extraction of cyanopyridine). Toluene is practically 100% recycled. 5. Energy requirements are largely covered by the exothermic nature of the main reaction. 6. Catalysis is used in every step to increase efficiency of the reaction and reduce energy requirements. No fewer than six catalysts are employed in the process. 7. Hazardous materials are avoided. Apart from a relatively small quantity of carbon dioxide there is no environmental waste. Early routine quantitative assessment of the "greenness" of processes or even single reactions is very important since it allows the introduction of green metrics at the very beginning of process and reaction design, at the "lab bench" stage, instead of during the late process development. In the end this favors the implementation of processes that are "green" by design, instead of processes turned "green" at a very late stage of process development. Despite the fact that many sophisticated tools are available to assess in great detail the environmental impact ofprocesses, simpler tools to be used by all chemists on a routine basis are far less abundant, and so is the practice of evaluating reactions greenness at the research stage. Quantitative evaluation of chemical processes in terms of environmental impact and eco-friendliness has gradually become a topic of great interest since the original introduction of the atom economy (AE) by Trost , and the E-factor by Sheldon . Since then, other indexes have been proposed for the green metrics of chemical processes, such as effective mass yield (EMY) , reaction mass efficiency (RME)  and mass intensity (MI) , along with unification efforts [6, 7] and comparisons among these indexes . All the above metrics are only based on masses of waste: they do not take into account the nature of the waste. The necessity of metrics that consider not just the amount of the waste but also its environmental impact was first recognized by Sheldon . To put it in his words: "Comparing alternative routes solely on the basis of the amount of waste is to grossly oversimplify." So, he defined the environmental quotient (EQ) as the product of the E-factor (E) and an unfriendliness quotient, Q. However, despite the simplicity of this definition, the quantitative assessment of Q is not so obvious. Sheldon's original proposal to arbitrarily assign to any substance a Q value relative to that of NaCl, which is set to 1, does not fully solve the problem. This has been followed by a few papers dealing with this problem . However, the methods proposed suffer from a difficult calculation basis and therefore are not amenable for a rapid evaluation and/or screening of the environmental impact of alternative synthetic pathways. In 2002, Eissen and Metzger proposed EATOS (an environmental assessment tool for organic syntheses), an environmental performance metrics for daily use in synthetic chemistry . This tool allows rapid quantitative assessment of both the E-factor and the potential environmental impact (PEI, Sheldon's Q) of a process. They also provided a PC software application to perform this calculation, which is available from them . With this tool, Sheldon's Q can be quantitatively assessed for both the feedstock and the output (product and wastes) of a multistep synthesis. The assessment is made on the basis of the available substance's ecotoxicological and human toxicological data. A comparative assessment between two alternative routes to Elliot's alcohol, an industrial intermediate in the preparation of pyrethroids of the resmethrin family, is presented in this chapter. This assessment is made with the aid of the EATOS tool and takes into consideration both the masses (E-factor) as well as environmental impact of the substances employed and released by the processes (Sheldon's Q). Industrial preparation of resmethrin, one of the first members of the pyrethroid family to be introduced, is achieved via Elliott's alcohol. Available procedures make use of stoichiometric amounts of pyridine, thionyl chloride and fuming nitric acid, and a lot of chlorinated by-products are generated. We present here an alternative route to Elliott's alcohol, based on the Baylis-Hillman reaction in aqueous media. A comparative quantitative assessment of the "greenness" has been performed, using the freeware package EATOS, which takes into account both the mass economy and the environmental impact of the materials involved. Pyrethroids are synthetic insecticides that possess greater insecticidal potency and enhanced photostability than plant-derived pyrethrins. Thanks to their low mammalian toxicity and biodegradability they have emerged as a replacement for DDT since the late 1960s. The demand for pyrethroids is increasing, also due to the upgraded agriculture technologies of "emerging countries" such as China . Resmethrin (Figure 16.1) was one of the first members of the pyrethroid family to be used. It is commercialized as the mixture of the four stereoisomers, while the most active (1R,3R)-trans stereoisomer is sold under the name bioresmethrin. 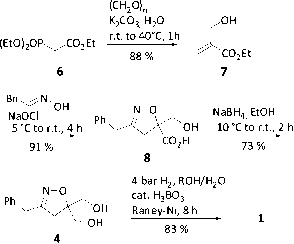 Figure 16.1 Elliott's alcohol (1) and resmethrins. Bioresmethrin is one of the most effective broad spectrum insecticides currently available. It exhibits a high order of insecticidal activity, which is coupled with its excellent toxicological properties . They are both chrysanthemic acid esters of (5-benzylfuran-3-yl)methanol (Elliott alcohol, 1) . Patented methods  for the industrial preparation of Elliott's alcohol are demanding or such as to be hardly exploited in industrial-scale plants. For instance, in one of these methods  (5-benzyl-3-furyl)methanol is obtained by a sequence of Claisen condensation of benzyl cyanide and a dialkyl succinate, hydrolysis, esterification, protection of the ketone group, formylation, cyclization to 5-benzyl-3-furfuryl ester and reduction to alcohol with lithium aluminium hydride. The process is particularly laborious, it requires anhydrous solvents and uses lithium aluminium hydride, the handling of which requires numerous precautions. More promising, in terms of "green" efficiency, was the procedure  for obtaining 1 depicted in Scheme 16.1. The key step of this procedure is an extremely atom efficient and regiospecific dipolar cycloaddition between an in situ generated nitrile oxide and isobutene diacetate (2). The cycloadduct is then converted into 1 by a simple saponification/hydrogenolysis/furan ring formation three-step sequence. Scheme 16.1 Previous procedure for the preparation of Elliott's alcohol (1). The weak point of this method is the supply of isobutene diacetate (2), which is expensive and difficult to find in bulk quantities, or can be prepared by a double nucleophilic displacement from the corresponding dichloride (5, Scheme 16.2). Scheme 16.3 depicts a preparation of dichloride 5  that is claimed to be safer and more convenient. Of course, this preparation poses a heavy burden on the environment. In the first step, huge amounts of pyridinium salts and SO2 are generated along with 20% of a tetrachlorinated by-product that has no use but which has to be discarded in the following step. The second step is accompanied by a large NOx evolution, while the final step releases carbon dioxide and HCl. Scheme 16.2 Preparation of diacetate 2. An alternative procedure [20, 21] for obtaining Elliott's alcohol has been based on the efficient cycloaddition reaction (Scheme 16.1) but avoids the use of isobutene diacetate and all the wastes associated with its preparation (Schemes 16.2 and 16.3). This new procedure makes use of an alternative building block for the cycloaddition step, namely, ethyl 2-(hydroxymethyl)acrylate (7), which can be easily prepared via a known  tandem olefination/Baylis-Hillman sequence (Scheme 16.4) from commercially available and inexpensive triethyl phosphonoacetate (6), paraformaldehyde and potassium carbonate as the base, in water at 40 °C for 1 h .
Scheme 16.4 Alternative route to Elliott's alcohol (1). in the cycloaddition step? (ii) Would this reaction regiospecifically afford the desired isomer? (iii) Can the new cycloadduct be converted into Elliott's alcohol? However, it was found that by treating 7 with phenylacetaldehyde aldoxime and 10% NaOCl, the desired cycloadduct 8 is regiospecifically obtained in high yield (Scheme 16.4). After extractive work-up the product is obtained pure enough to be used in the next step without any further purification. This cycloaddition reaction was then followed by an effective reduction of the carboxylate moiety to obtain the bishydroxyl derivative 4, the intermediate that is in common with the procedure depicted in Scheme 16.1. This reduction does not need environmentally and safety problematic aluminium hydride reagents, as it is usually necessary for the reduction of an ester moiety. It can be performed, in good yields, with easier-to-handle granular sodium borohydride in lower alcohols. Here we can see another additional "green" bonus of the new starting material chosen: probably the free OH group in compound 8 assists and facilitates the reduction of the ester group, making it possible with the milder sodium borohydride, and avoids the need for aluminium hydride reagents. Finally, 8 is converted into Elliott's alcohol according to the original procedure  or by hydrogenation in lower alcohols/water solution in the presence of Raney nickel and orthoboric acid . Summarizing, the alternative route to Elliot's alcohol (1) makes use of 2-(hydro-xymethyl)acrylic acid esters, such as 7, as the new starting materials (Scheme 16.4). On the "green" side, the choice of this alternative starting material allows us to keep the atom economic efficient cycloaddition step of the previous procedure (Scheme 16.1), while producing a great reduction of steps, waste amount, and waste toxicity and hazards. In fact, the existing synthetic sequence (Schemes 16.3 and 16.2) is now replaced by one step only: the first step depicted in Scheme 16.4. Thus, the wastes associated with the existing methodology (3 SO2, 3 pyridinium salts, the tetrachlorinated by-product, 7 NOx, CO2, HCl) are now replaced by the wastes associated with the first step of Scheme 16.4 (excess CH2O and phosphate salts). However, this kind of "qualitative" greenness assessment, based only on the visual inspection of reaction schemes, may be too limited and may lead to erroneous conclusions. Consequently, a comparative quantitative assessment of the two routes was needed. This "quantitative" greenness assessment compares the two alternative routes: the best existing one (Schemes 16.1 to 16.3)  and the new route (Scheme 16.4). Both routes are compared up to the common Elliott's alcohol intermediate 4. Scheme 16.5 depicts the two different routes. 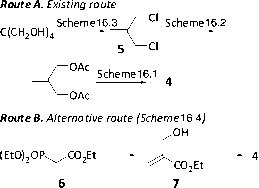 Scheme 16.5 Alternative routes to the common intermediate 4 to Elliott's alcohol. use of problematic formaldehyde in route B counterbalance the use of problematic pyridine and SOCl2 in route A? Obviously to answer these and other questions a quantitative assessment is needed. The E-factor has been calculated for both routes, considering the amounts and yields reported in references [18, 19] for route A and in the Experimental section in reference  for route B. Comparison of the E-factors (Figure 16.2) clearly shows how route B is much less mass intensive than route A. In fact, for each kilogram of compound 4, route A produces 183 kg of wastes while route B produces only 102 kg, that is, a net 44% reduction. Inspection of EATOS graphical output (Figure 16.2) also allows us to see where these wastes comes from. Much of the wastes produced in route A (76 out of 183 kg; blue block) are aqueous and come from aqueous reagents and aqueous work-up. Further inspection of this segment with the EATOS tool shows that most of this aqueous waste is produced in the early steps of route A (Scheme 16.3), especially from the use and subsequent removal of mineral acids and their salts. Inspection of the wastes produced in route B shows that most of them come from the auxiliary materials used during isolation steps (41 kg out of 102 kg; brown block) of the process (Scheme 16.4). Overall isolation steps produce most of the wastes in both routes: the figures are 105 kg-waste per kg product (57% of the total waste produced) for route A and 51 kg-waste per kg product (50% of the total waste produced) for route B. These figures clearly show how a "greenness" evaluation of a process based only on "visual inspection" of synthetic schemes can be misleading: a very large part of the waste comes from isolation steps, which do not appear in synthetic schemes. Moreover, some green metrics, such as atom economy do not consider at all this portion of waste. 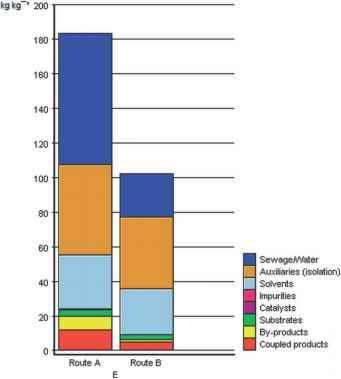 Figure 16.2 Comparison of E-factors (kg waste per kg product). To assess the environmental impact of chemical processes, EATOS can take into consideration up to ten different substances' ecotoxicological and human toxicolog-ical parameters, and each parameter can be given a different weight. Such substances' parameters are then normalized (each parameter is made to vary from 1 to 10) and then combined to afford an environmental quotient (EI) (much the same as Sheldon's Q). Thus, each different component of the waste can be assigned a quantitative potential environmental impact PEIout (much the same of Sheldon's environmental quotient EQ), defined as the product of its mass (relative to the product unit mass) with its EI. Figure 16.3 Graphical comparison of potential environmental impact of waste. European Chemicals Bureau (http://ecb.jrc.it/) and the Hazardous Substance DataBank (http://toxnet.nlm.nih.gov/). When insufficient data were available for human chronic toxicity, a prediction of the carcinogenic and mutagenic effects was performed with the OSIRIS tool, available at the Organic Chemistry Portal (http:// www.organic-chemistry.org/prog/peo/). 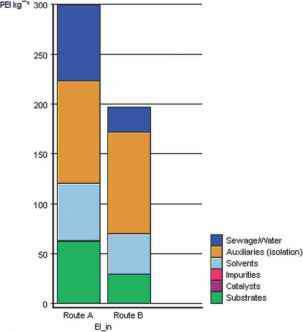 Figure 16.3 gives a quantitative comparison of the potential environmental impact of waste (PEIout). 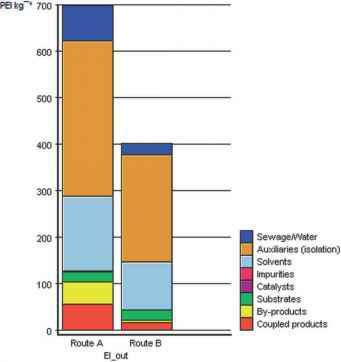 Figure 16.3 allows us to see immediately that route B also permits a large decrease in waste environmental impact: the figures are 697 and 402 PEI-unit per kg of product for routes A, and B, respectively, that is, route B achieves a net 40% reduction in waste potential environmental impact. In both routes most of the environmental impact is generated by auxiliary materials (those needed only for product isolation; brown blocks in Figure 16.3). In particular, in route A nearly all (96%) of auxiliary waste is due to the dichlor-omethane used for product extraction in three different steps of the process. In route B, again most of the auxiliaries waste comes from solvents needed for product isolation. Further inspection Figure 16.3 and comparison with Figure 16.2 affords some other useful insights. The aqueous waste (blue block) although relevant in mass terms (Figure 16.2) is much less relevant in environmental impact terms: in route A the aqueous waste is more than 40% of the waste total mass (Figure 16.2) while it contributes to only less than 11% of the waste total potential environmental impact (Figure 16.3). Conversely, auxiliary materials of route A account for 25% of the waste mass (Figure 16.2) and for nearly 50% of waste environmental impact. Similar values are found for reaction solvents. Again, it is important to stress how misleading an environmental assessment could be based only on waste masses: relatively small portions ofthe waste mass can account for relatively large environmental impacts. Comparison of the waste produced by the two routes shows that route A suffers from poor reaction conditions more than route B. In fact, in route A the environmental impact of the waste related to reaction - that is, coupled products, by-products and excess substrates - accounts for 124 PEI kg-1 (nearly 20% of the total waste). Nearly all of this waste is produced in the early steps of route A (Scheme 16.3). In route B the same figure is 41 PEI kg-1 (10% of the total waste of route B). Figure 16.3 shows how route B, compared to route A, produces very little by-products (yellow block) and less coupled products (red block), while it has a similar impact due to excess substrates waste (green block), which for route B is essentially due to excess paraformaldehyde and NaOCl, respectively, used in the first and second steps of Scheme 16.4. Thus, the environmental analysis performed with the aid of EATOS makes it clear (in quantitative terms) that any effort for the reduction of the environmental impact of both processes should take into consideration, in the first place, an improvement of isolation procedures, that is, using less and/or less toxic auxiliaries - a result that would not have been possible at all considering other metrics such as atom economy, or would have been greatly underestimated using metrics based only on masses. The environmental impact can also be calculated for the feedstock of the process (PEIin), allowing us to assess the hazards and the costs associated with the use of the starting materials of a particular process. This should always be carried out to make sure that a decrease of the environmental impact of waste is not made at the expense of using more hazardous or (environmentally) expensive starting materials. For the feedstock environmental impact evaluation, EATOS considers risk-phrases and the cost associated with each substance. (For a discussion ofthe cost as a metrics for starting material environmental impact, see Reference .) These data were obtained for all substances, of both routes, from the 2007 Sigma-Aldrich catalogue. Figure 16.4 reveals that route B also allows a decrease (33%) in the potential environmental impact of materials used for the preparation of Elliott's alcohol intermediate 4. Again, most the hazards and costs come from the use of auxiliaries. For route A a significantly higher proportion of the potential environmental impact of the materials used is due to reaction substrates (green block) and especially to thionyl chloride. Figure 16.4 Graphical comparison of potential environmental impact of feedstock of synthetic routes depicted in Scheme 16.5. Table16.1 Comparison of EATOS environmental indexes ofwaste (EI_out) and of feedstock (EI_in) for both synthetic routes. b % Difference between route B and route A.
about was in the environmental impact of the aqueous waste ( (-58%), and in the by-products (-89%). EATOS can also be used as a powerful tool to drive the "green" improvement of a chemical synthetic sequence. For example, from Table 16.1 it is clear that, in absolute terms, the greatest contribution to environmental impact of both routes comes from the auxiliaries materials, that is, materials used for isolation and/or purification of the product. Therefore, efforts to further decrease waste environmental impact should be directed, in the first place, towards finding alternative and greener isolation procedures. In this sense, EATOS can again be very useful since it can be used to rapidly answer a manifold of "what if" questions. Further insight into the waste environmental impact generated by the auxiliary materials used in route B shows that 225 out of 230 of this impact is due to the solvents (diethyl ether and dichloromethane) used for extractions in the synthesis. For example, what if we could manage to replace those solvents with the same amounts of ethyl acetate? Using EATOS, the rapidly obtained answer to this question is that the environmental impact of the waste generated by the auxiliary materials would be reduced dramatically from 230 to only 40 EATOS units. At this point, it is important to stress that the use of any other green metrics based on masses only (atom economy, RME, MI, etc.) leads to the wrong conclusions. In fact, these metrics would record no change in the "greenness" of the process, since toxic solvents are replaced by the same amounts of the less toxic ethyl acetate. This chapter has presented a quantitative assessment of the environmental impact of two alternative procedures for the preparation of Elliott's alcohol. The assessment was made with the aid of the EATOS tool. This is an easy to use software tool that can be used routinely to assess the "greenness" of reactions or synthetic schemes. Its simplicity allows for a daily routine use, thus favoring the introduction of "green" elements at a very early stage of synthetic process design. Moreover, the results ofthis comparison show that the alternative process allows a significant reduction ofthe mass ofwaste, the environmental impact ofwaste and of the hazards and costs associated with the materials used for the process. With the aid of the EATOS tool it was also possible to establish the process zones were most of the environmental impact is produced. From the analysis, it clearly emerged that the use of other green metrics based only on waste mass would have led to different or underestimated results. 1 Trost, B.M. (1991) Science, 254,1471; Trost, B.M. (2002) Acc. Chem. Res., 35,695; Trost, B.M. (1995) Angew. Chem. Int. Ed. Engl., 34, 259. 2 Sheldon, R.A. (1992) Chem. Ind. (London), 903-906; Sheldon, R.A. (2007) Green Chem., 9, 1273-1283. 3 Hudlicky, T., Frey, D.A., Koroniak, L., Claeboe, C.D. and Brammer, L.E. (1999) Green Chem., 1, 57-59. 4 Curzons, A.D., Constable, D.J.C., Mortimer, D.N. and Cunningham, V.L. (2001) Green Chem., 3, 1-6. 5 Constable, D.J.C., Curzons, A.D., Freitas dos Santos, L.M., Green, G.R., Hannah, R.E., Hayler, J.D., Kitteringham, J., McGuire, M.A., Richardson, J.E., Smith, P., Webb, R.L. and Yu, M. (2001) Green Chem., 3, 7-9. 7 Andraos, J. (2005) Org. Process Res. Dev., 9, 149-163; Andraos, J. (2005) Org. Process Res. Dev., 9, 404-431; Andraos, J. (2006) Org. Process Res. Dev., 10, 212-240. 8 Constable, D.J.C., Curzons, A.D. and Cunningham, V.L. (2002) Green Chem., 4, 521-527. 10 Heinzle, E., Weirich, D., Brogli, F., Hoffmann, V.H., Koller, G., Verduyn, M.A. and Hungerbuhler, K. (1998) Ind. Eng. Chem. Res., 37, 3395-3407; Koller, G., Weirich, D., Brogli, F., Heinzle, E., Hoffmann, V.H., Verduyn, M.A. and Hungerbuhler, K. (1998) Ind. Eng. Chem. Res., 37, 3408-3413; Lepper, P., Keller, D., Herrchen, M., Wahnschaffe, U. and Mangelsdorf, I. (1997) Chemosphere, 35, 2603-2618; Steinbach, A. and Winkenbach, R. (2000) Chem. Eng., 4, 94-100; Koller, G., Fischer, U. and Hungerbuhler, K. (2000) Ind. Eng. Chem. Res, 37, 960-972. 11 Eissen, M. and Metzger, J.O. (2002) Chem. Eur. J., 8, 3580-3585. 12 Eissen, M. and Metzger, J.O., EATOS® (Environmental Assessment Tool for Organic Syntheses). http://www.chemie. 13 United Nations FADINAP (2002) Agro-chemical Reports 2, 29-35. http://www.fadinap.org/niblist.htm. 14 Ford, M. G. and Pert, D. R. (1974) Pesticide Science, 5, 635-641; Gaines, T.B. and Linder, R.E. (1986) Fundamental and Applied Toxicology, 7, 299-308. 15 (a) Elliott, M., Farnham, A.W., Janes, N.F., Needham, P.H. and Pearson, B.C. (1967) Nature, 213, 493-494; (b) Elliott, M. (1969) Chem. Ind., 776-781; (c) Elliott, M., Janes, N.F. and Pearson, B.C. (1971) J. Chem. Soc. (C), 2551-2554. 16 For alternative procedures for the preparation of 1 see: Naumann, K. (1990) Synthetic Pyrethroid Insectides: Chemistry and Patents in Chemistry of Plant Protection, Vol. 5 (eds W.S. Bowers, W. Ebing, D. Martin and R. Wegler), Springer-Verlag, Berlin, Ch. 2, pp. 112-115. 17 US patent 3,466,304 (1969), assigned to National Research Development Corporation, London, England. 18 EP 0 187 345 (1986), assigned to BASF, Germany; US 4,954,633 (1990), assigned to BASF, Germany. 19 Mondanaro Lynch, K. and Dailey, W.P. (1998) Org. Synth., 75, 89. 21 Rosini, G., Borzatta, V., Paolucci, C. and Righi, P. (2008) Green Chem., 10, 1146-1151. 22 Villieras, J. and Rambaud, M. (1988) Org. Synth., 66, 220. 23 For alternative and efficient preparations of hydroxymethacrylate esters via Baylis-Hillman reactions in aqueous media, see: (a) Dunn, P.J., Hughes, M.L., Searle, P.M. and Wood, A.S., (2003) Org. Process Res. Dev., 7, 244-253; (b) Mathias, L.J., Kusefoglu, S.H. and Kress, A.O. (1987) Macromolecules, 20, 2326-2328. 24 Curran, D.P. (1982) J. Am. Chem. Soc., 104, 4024. How is niacin prepared from methyl pyridine? How does Nmethylpyrrolidinium ion reacts with nicotinic acid to form nicotine?